1. Go to Pages > Add New and name your page “Home”. 3. Beside Front Page choose “Home.” Do nothing for Post Pages. 1. Make sure you have the Kadence Slider installed and activated in your admin. 2. Add a new slider and customize as desired. Set the width to full. 3. Once your slider is set up, go to Theme Options > Slider Settings. 4. Choose Kadence Slider as your Home Image Slider. 5. Choose your slider. *Note these slider features can also be done using the Kadence Slider. Note* – There are theme options export for style 3 in the demo content. 1. Go to Theme Options > Home Layout and in the Homepage Layout Manager enable Page Content, On Sale Products, Featured Products, and Latest Blog Posts (in that order). Note* see here to learn how to make products featured. 2. Scroll down the page and customize each field that was just enabled. 1. Go to Theme Options > Main Settings. 2. Here you can customize the font family and color of your logo or choose to upload an image as the logo. 3. Scroll down to Header Style and choose “Standard”. 4. Go to Theme Options > Advanced Styling. 5. Scroll down to Header Background and set the background color to your whatever you would like. Do the same for the Secondary Menu Background. *Note see here to learn about creating custom menus. 1. Set up a menu and select “Primary Navigation” under Menu Settings (your primary menu will display to the right of the logo). 2. Set up another menu with descriptions and select “Secondary Navigation” under Menu Settings (your secondary menu will display below the logo). *Note to add descriptions pull down the screen options tab on the top right of page and select description. This will open up a description box for each menu item. 1. In Theme Options > Topbar Settings choose to use the topbar. 2. Choose to show cart total in topbar. 4. Go to Appearance > Menus and create a menu for your topbar and set the Menu Settings to Topbar Navigation. 5. Go to Appearance > Widgets and add a Virtue: Social Links widget to your topbar. 6. Go to Theme Options > Advanced Styling and customize your topbar background. 1. Go back into the home page that you created and select the Page Builder tab (on the right) and then click the Add Row tab (on the left). 2. Give the row 3 columns. 3. Click the Add Widget tab and choose the Virtue: Image Menu Item widget. 4. Upload an image and give it a title, description and link. 5. Repeat this process so that each column has a menu item. 2. Set the Footer Widget Layout to a 4 column layout. 2. Find the Text widget and add it to footer column 1. 3. Give it a title and description. 4. Find the Virtue: Contact/Vcard widget and add it to footer column 2. 5. Fill out the form with desired information. 6. Find the Virtue: Social widget and add it to footer column 2. 7. Give it a title and fill in your own social URL’s. 8. Find the Virtue: Post Grid widget and add it to footer column 3. 9. Give it a title and fill out settings as desired. 10. 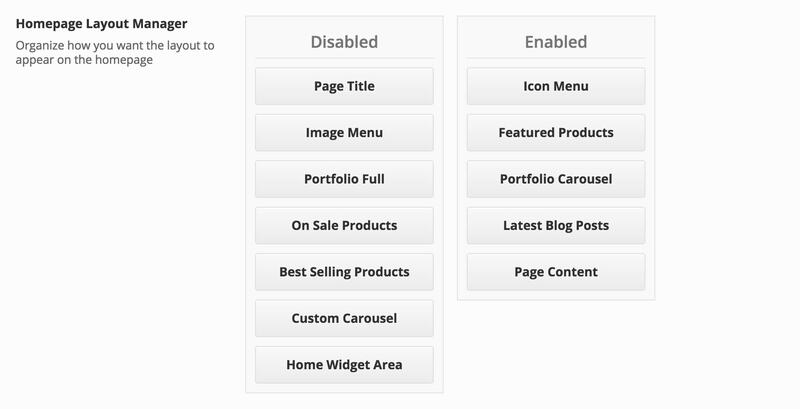 Find the Custom Menu widget and add it to footer column 4. 11. Give it a title and select a pre-built custom menu. 1. Go to Theme Options > Advanced Styling. 2. Scroll down to Footer Background and select a background color. 3. Go to Theme Options > Basic Styling. 4. Choose your Footer Font Color.